In preparation for our upcoming musical spectacular, Little Miss Glitz, we are looking for volunteers to help with our fabulous audience experience. Volunteers are vital to the success of local theatre, and we truly couldn’t do it without your contribution to this ambitious artistic endeavour. The show runs March 16-31, Wednesday to Sunday; see show dates and times below. We need 4-5 volunteers each night and we’ll be running a training session (see below) to prepare our volunteer team. If you are interested and available, please read through the following details and email mattchew_@hotmail.com. Box Office & Fundraising – Check in guests and sell tickets at the door before the show. Help sell raffle tickets during intermission. Concession – Sell food and beverage, pour alcoholic beverages, clean up the concession area after service. Must be 19+ and hold Serving It Right or Special Event Server certification. Usher – Help guests find seats before the show. Assist guests who leave during the show. Clean the theatre during intermission and after the show. Shifts – Volunteers are asked to commit to a minimum of two shifts, but the more the merrier! We would prefer you do the same role each shift, but we are flexible if you want variety. Timing – Please arrive promptly at the start time of your shift for setup. Volunteers will be able to watch the show on the night of their shifts if they want, otherwise please bring a book or something to keep you occupied during the first act. Training – We are creating a fabulous audience experience, and to help you all prepare we will be sending out a detailed training email. 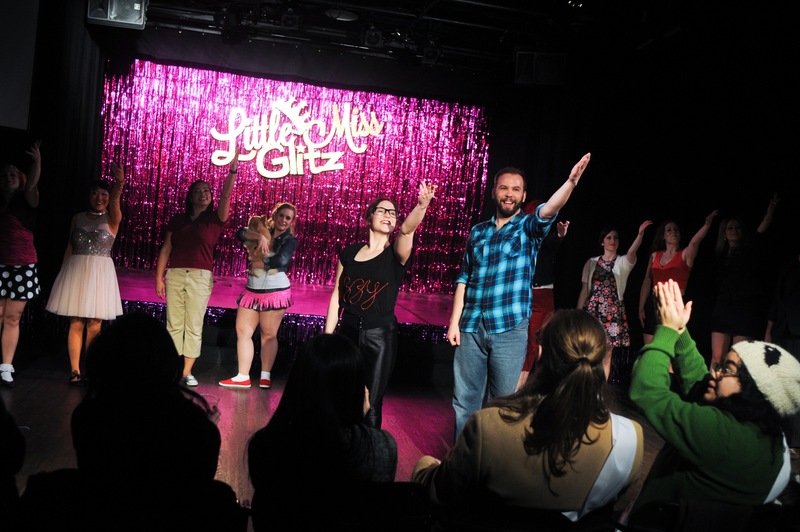 Volunteers are also invited to the preview of Little Miss Glitz, Thursday March 15 at Performance Works. Dress – To match the theme of the show, please wear pink, purple and/or bright blue, and we’ll have fun accessories to complement. Appreciation – As a token of gratitude for your commitment, you will receive a comp ticket for every two shifts you work. Please email mattchew_@hotmail.com to sign up as a volunteer.